If the Blue Winged Olive is the tiny Cessna of the mayfly family, the Green Drake is the hulking Boeing 787! The Green Drakes are one of the largest mayfly families and are also one of the most eagerly-anticipated and pursued by trout. Specific to streams and rivers, these big bugs offer great action both below and on top of the water. When emerging, it takes the duns a long time to stretch and try their wings before they can take off, making them vulnerable to rising trout. Our Western Green Drake selections have been crafted to allow the angler to fish every life stage of this important mayfly species (Nymph, Wet Emerger, Dry Emerger, Dun, Spinner, and Spinner Fall). The Small Selection will focus on the go-to fly patterns for this hatch and includes 6 dry fly patterns and 6 wet fly patterns. The Medium Selection will expand upon both the dry and wet life stages and includes 16 dry fly patterns and 8 wet fly patterns. The Large Selection exhaustively covers every life stage of the Green Drake, includes 24 dry fly patterns and 12 wet fly patterns, and will ensure that you will be ready to fish throughout this epic hatch! 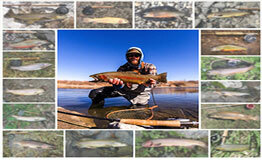 The quantity of flies dedicated to each life stage is based on their importance to the fly fisher and feeding trout.